Acoustics in the News: Grunt-O-Meters! Yesterday, I ran across an interesting story, which manages to combine two of my favorite topics: acoustics and tennis! This story covers the controversy over tennis players grunting – or even shrieking – during a match. Until the 1990s, tennis was predominantly a quiet sport. Then, some of the players started the practice of grunting when they hit the ball. Gradually, they’ve been getting louder and louder. The argument in favor of grunting is that these sounds are a breathing technique and increase the energy put into each shot. However, many players and fans argue that these ever increasing noises are interfering with the proper play of the game. Some go as far as to say it’s cheating (more on that later). As the article points out, this issue is of enough concern that the Women’s Tennis Association is embarking on an educational program to try to prevent future generations of players from developing this habit. Current players, including Maria Sharapova (who’s quite famous for her shrill shriek), say it would be impossible for them to eliminate this habit after playing this way all of their lives. So what’s the problem with the grunting and shrieking? Well, first it’s irritating and distracting to the player’s opponent. As the article mentions, some players have been measured at levels up to 105 dBA, which is as loud as a chainsaw from a few feet away. Others feel that it’s simply unsporting. 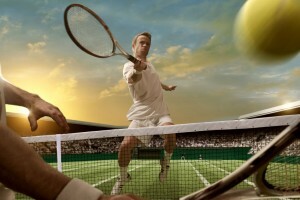 Tennis is an extremely fast-paced sport with a requirement for split-second reactions. Professional players use a variety of visual and audible cues to assess a competitor’s shots, including the sound the ball makes as it’s struck and flies through the air. However, this sound can be substantially masked by the opponent’s shrieks or grunts, robbing a player of key clues as to how a ball was hit. Of course, it can also be a simple distraction. One of the suggestions for addressing these ever-escalating utterances during play is to equip tennis officials with grunt-o-meters – essentially sound level meters that would allow them to measure just how loud a player is. However, this solution has its challenges, because once they can measure the volume, they’ll need to determine what level is acceptable. They may also need to consider the ‘tone’ of the grunt or shriek to decide if it’s allowed; for example, lower frequency grunts might be allowed while shrill cries might not. I’m sure you tennis fans out there each have your own opinion about this issue. It’ll be interesting to see the direction in which the sport goes in the future.